Let’s find some beautiful place to get lost. And then we can come back home and spend the weekend in bed reading newspapers and sipping hot chocolate, OK? Because that’s what I’d want to do if this were my bedroom. 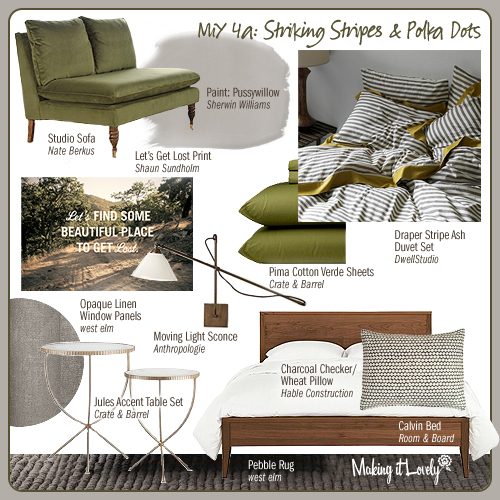 I love the striped bedding, and I’m particularly like the way the chartreuse picks up on (but doesn’t match exactly) the green sheets and sofa. Warm gray paint, linen curtains, and a soft rug add to that never-want-to-leave coziness. I’d introduce polka dots in a pillow on the bed, and again over on the sofa. And then of course we have the same bed, tables, and sconces that will appear in each look of this fourth edition of Making it Yours. The next installment of MiY will feature a lighter, more colorful look that I’m calling “Feminine Moorish”. Intrigued? Very interesting first bedroom. It is slightly more on the masculine side, no? Cant wait to see the next one! I am now drooling over those Dwell sheets. Wow-ee. i love this room – almost enough to go and re-paint my light gray/blue bedroom and start over! you picked some great pieces for this series, can’t want to see what you do with them next. LOVE it. I want to add more green to my bedroom, now I have lots of ideas. Keep up the fab work! nice selection, calming, yes. 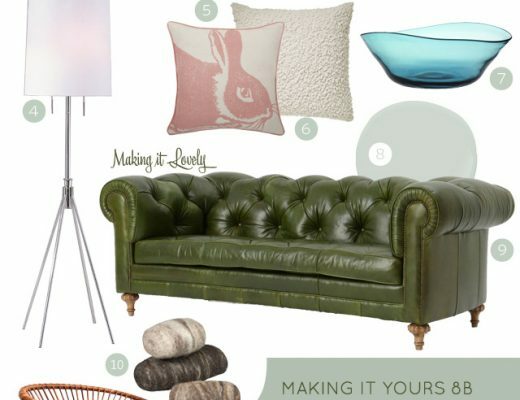 Love the studio sofa! I always struggle with wall art over the bed. Marimekko wall hanging? ikea framed set of three? size, proportion? that’s why I have a blank space above our bed! any advice in that department would be greatly appreciated and since I like to change out colors in a bedroom, selecting an interesting piece that goes with everything would be ideal or just don’t spend much to begin with and I”ll feel less guilty about changing the wall art too! That gray color on the colors is so rich – I would never have paired that with the sofa but it so WORKS! Oh yes. I think that means you have to go for it! Whoa, I would like to MOVE IN NOW. We’re redecorating our bedroom with a similar palette. Thanks for the ideas! I really love this one, especially that striped duvet. Love the duvet! What a great series; I’m loving the feel of this room and can’t wait to see how you turn things around for the next! I love those accent tables. They seem so versatile… look forward to seeing them in more rooms! I really, really love your choices, but have to ask – do people really pay that much for sofa’s, beds and such? Just the idea of a $1000 bed makes me insane!! Am I just too woefully thrifty? Sometimes I choose less expensive items, but I do believe that it’s good to invest in certain key pieces. 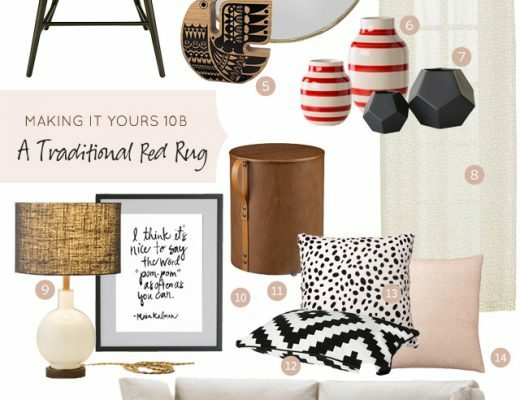 That’s why I love putting together these MiY boards… to show how an investment in a quality piece (or pieces) of furniture can work through changing tastes and styles. You spend over a third of your life in a bed (sleeping)! It’s a person’s most used piece of furniture, so why not splurge? Especially since a good night’s sleep is so important? love, love, love. i’ve been admiring those sheets for a while now. Great. Now I must check out Pussywillow in the Sherwin Williams color actualizer. If you don’t hear from me in two weeks, you know why. i am intrigued, but i have to say this one is awfully gorgeous. mmmmm. that rug looks amazing! That is beautiful! I so want that duvet set for my bed! Can’t wait to see what else you do. I am totally smitten with this room. In fact, if you don’t mind, I’m going to use all your suggestions. I’m interested…have you sat on the couch? I have an order-online-addiction, and I don’t want to jump the gun if it turns out to be totally uncomfortable. I haven’t sat on it, no. As far as I know, it’s only available through mail order. It’s so cute though, I hope it’s a comfortable as it is good-looking! Love the tones in this room, the whole collection is beautiful. Major crush on the rug though! Nicole, great design! 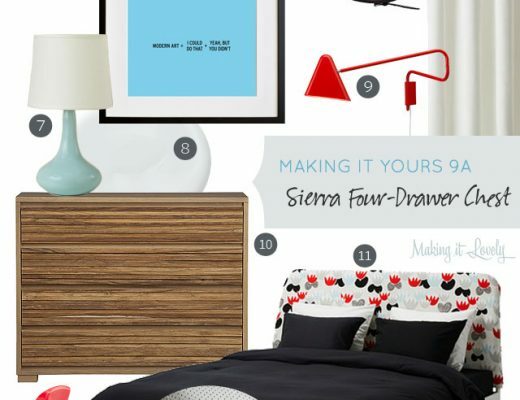 I have been loving the Dwell bedding ever since I saw Heather Armstrong’s bedroom, one of my favorite bedrooms. I’m looking forward to the Feminine Moorish design. I’m especially liking all the green! You’ve turned me on to HSN with your past few posts, it’s definitely not as I remember it! I could totally go for that stripe! oh nicole, i love MIY’s!! Simply gorgeous. These shades of green are so delicious. Love the sofa and the side tables! Love these picks! They’re masculine without being overt. Please the husband as well as the wife! I know my husband hates anything too girly or pretty. I love Love LOVE the duvet! LOVE IT. MUST HAVE IT! I love it! The color palette is so sophisticated. I can’t wait to see the next installment! I think you read my mind. I have an antique quilt for my guestroom that has a really graphic pattern using a lot of horizontal lines and it has really stumped me. Just last week I considered pairing it with the Hable Checker pillow as an accent. I love the striped sheets at West Elm too, they’re pretty awesome. I’m racking my brain trying to figure out a place for those without changing the whole bedding situation I’ve got going on now. I really really love this. I think I’m going to use this as a guide for my own room. But, because my room is so small, I’m going to reupholster a wing-back chair I have instead that fits into the room nicely. I’ve had the same bedroom set since I was 11. I think I deserve an update! What dresser/chest of drawers would you recommend for a room like this? i am LOVING the MIYs. you have such great taste and put things together so well. it’s very inspirational to me. thanks so much. i plan on stealing many of your ideas!!! I really love this one. Those striped sheets are lovely! Any idea of where someone can get a look-alike of those beautiful Crate & Barrel tables on the cheap? $450 is a little pricey, but I love them next to the green suede sofa which looks just like mine!